There are quite a few essential oils that are extremely calming to the nervous system. These oils have been proven to be able to ease anxiety in both people and some animals, including dogs. As mentioned in my post on Old Dog Anxiety, oldies are more prone to have anxiety. Why? It’s simply because they are more likely to suffer from some physical ailments, such as achy joints, or hearing loss. They may even be plagued by cognitive issues, such as canine cognitive dysfunction. These health problems can no doubt cause stress and anxiety to our poor oldies! While it is possible to use drugs to ease anxiety in old dogs, more and more dog parents are less willing to resort to drugs for every single problem that their dogs may have. Whenever possible, they opt for natural alternatives that are safer and equally effective. Essential oils are one such option. To use essential oils safely with older dogs, we need to exercise more care because of their more sensitive skin and weaker body. If you haven’t read my earlier post on using essential oils with older dogs yet, do it now and then come back to this page. There are quite a few essential oils that have calming and anxiety-reducing properties. Not all of them are safe to use with dogs though. And some calming oils have to be used with care. *This is more a warning for human dog moms than for old dogs: Clary Sage may cause significantly more menstrual flow if you use it during an already heavy period. **Bergamot can cause phototoxic response if used topically. Serious skin burning or damage can occur if, for example, you put Bergamot on your dog’s belly and he then goes sleep in the sun. It may be used safely (no phototoxic response) on the skin in a blend at no more than 0.4%. (Approximately 1 to 2 drops per 1 oz/30 ml of carrier). If you are just starting to use essential oils with your dog, here’s a tip for you. Try to create situations where your dog can associate the oils with something “good”. For example, when diffusing the oils, play his favorite game with him, or give him one of his favorite treats. This can reinforce your dog’s positive feelings towards these oils (oils = happy time). Now, let’s look at how to actually use these oils for stressful situations. If you can anticipate an upcoming event that may be stressful for your old dog (e.g. a trip to the vets or groomer), use some of the calming oils 15 to 20 minutes before the event to help your dog “chill out”. Perhaps the easiest way is to diffuse any, or a combination, of the above oils in a diffuser. Depending on the type of diffuser you use, add 5-6 drops of some of the above oils to the water in the diffuser. Let it run for 20 minutes or so. If you are using the oils for the first time, observe your dog to see if he shows any adverse response, such as panting, sneezing, restlessness, pacing. If so, remove your dog from the room immediately. You can also add a few of the essential oils to a cotton ball, and place it in your car on the way to the vets, for example. In addition to diffusion, we can also use the above oils to make a “calming oil blend” for topical application. If you are going to put the oils on your dog, make sure you dilute the oils with a carrier oil (e.g. sweet almond oil, coconut oil, jojoba oil). NEVER put undiluted essential oils on your dog. It is a dangerous practice that can cause not only skin irritation and sensitization, but also, in the long run, liver damage. Oil molecules can get absorbed through the skin into the blood stream and eventually will reach the liver for break down and metabolism. This puts an extremely heavy burden on the liver and if you do this regularly on your dog or yourself, I can guarantee one thing – liver damage! Essential oils are highly concentrated oils, so a little goes a long way. For oldies, I would start with a very low dilution (0.5 percent to 1 percent). Exactly which oils to choose and how many drops of each oil should be in a blend is largely a personal preference. Choose oils with scents that are pleasing for you (and your dog). To use the blend, put a few drops on your hands and rub them together to distribute the oils on both of your hands. Then pet your dog gently with your “well-oiled” hands, especially the shoulder and heart areas. You can also put a few drops of oils on yourself so your dog can smell the oils from you as well. This multi-prong approach works very well in calming a stressed and anxious dog. Same as ambient diffusion, try to use the calming oils 20 minutes or so before an anticipated stressful situation. If possible, repeat the “petting” every 20 minutes. Here are some recipes of calming oil blends that you can try to use on your old dog. Remember, all dogs are individual beings. While all these essential oils are generally considered safe for dogs, YOUR dog might react differently. So if you are using any of these oils with your dog for the first time, go slowly and observe the dog carefully. Add to a dark glass bottle. Shake to mix well. Add 5 to 6 drops of the blend to your diffuser and diffuse for 20 minutes. The citrus scent from Bergamot and Sweet Orange can also stimulate the appetite, so if your old dog has a sluggish appetite, this can help as well! In a dark glass bottle, mix either Blend 1 or Blend 2 with 30 ml (1 oz) of a carrier oil (e.g. jojoba oil). Shake to mix well. This is a 1 percent dilution. 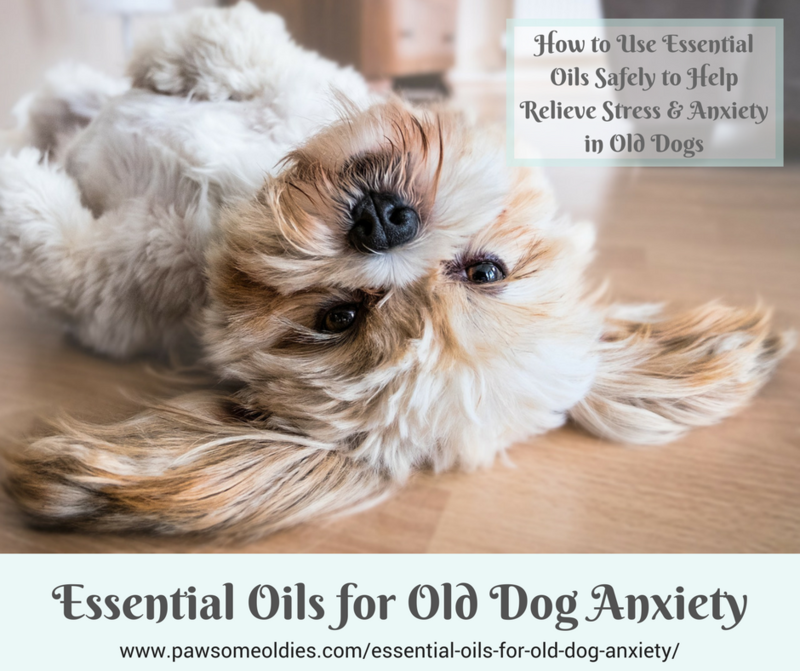 If used safely, essential oils for old dog anxiety can be a very effective way to calm a stressed dog. The calming effects come from specific chemical components in such oils, and there are studies and research to back up such effects. However, I find one little problem when using essential oils to treat mental issues such as anxiety. The problem is, the response can be rather individualized. Some dogs may react to one oil or oil blend much better than others. So if an essential oil or blend just doesn’t do the job for your dog, don’t be afraid to try other safe oils until you can find a few oils that work well. 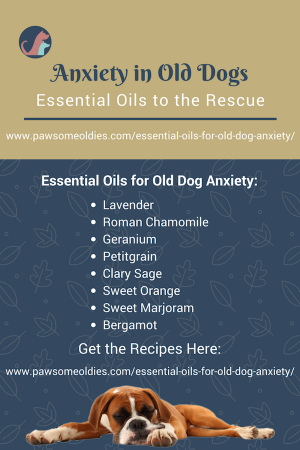 Also, using essential oils is just one of various ways to ease anxiety in old dogs. It should not be the ONLY way. Consider other alternatives such as herbs and supplements as well.